Play is something that is introduced to our children at a very young age, it's so important for children to play and it's even more important for them to learn how to use their imagination to play! I love encouraging my children to play and sometimes the perfect toy can provide hours upon hours of play. Lakeshore Learning creates award-winning educational products for families and schools, we personally love Lakeshore products and own quite a few! At Lakeshore Learning you will find arts and crafts, blocks and manipulatives, games and puzzles, pocket charts and so much more! This year's holiday gift guide at Lakeshore Learning is full of gifts for every child. While I was browsing for ideas for Little Sister C, I came across the adorable Fully Furnished Adventure Treehouse. I knew this was something she would love and I couldn't wait for her to see it! 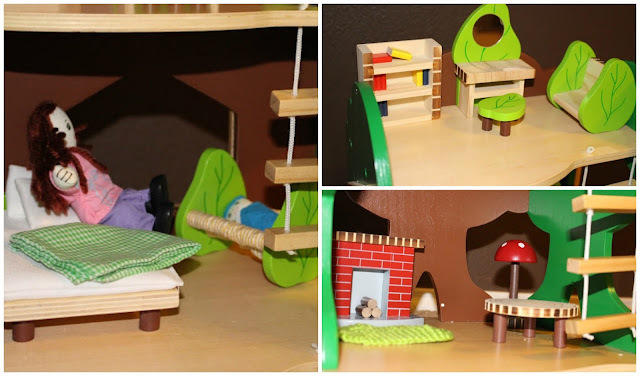 The Fully Furnished Adventure Treehouse from Lakeshore Learning has it all - it looks like a real treehouse and has all the charm of the real thing! The 3-story hardwood treehouse includes everything your child needs for hours of imaginative play! From a cozy fireplace to a rocking chair, this set includes 20 pieces of fun and unique treehouse furniture. This treehouse is beautifully made, it's sturdy and the colors are rich, this is one set that will last for a really long time! My daughter had no problem falling in love with the Fully Furnished Adventure Treehouse, she couldn't get over how adorable the furniture pieces were! She enjoys gathering her Soft & Poseable Family and pretending to read them a bedtime story, or she'll have them climb down the ladder to have breakfast by the fireplace! The Soft & Poseable Family is not included in the Fully Furnished Adventure Treehouse, however they are the perfect size and can be purchased online at Lakeshore Learning. So what do you think? Little Sister C is a huge fan of the Fully Furnished Adventure Treehouse and I think your children would enjoy it as well! Be sure to stay connected with Lakeshore Learning on Facebook and Twitter! The Fully Furnished Adventure Treehouse can be purchased online from Lakeshore Learning for $49.99! You can save 20% on your next purchase by grabbing a coupon here! This is adorable! I love that its tall and wouldn't take up a lot of space and it seems like a great price compared to many other plastic "doll houses."